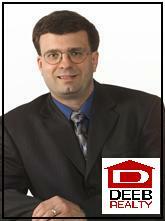 Licensed in NE deebrealestate.com Having been in customer service for over 18 years is where I seperate myself from the rest. I can offer sellers various marketing stratagies for getting your home sold vs. "one size fits all" option offered by my competition. Dialog and communication is important to obtain a satisfied client. No "junk fees" with me. Having been a buyer's agent for over 3 years with one of the largest teams in Omaha, I quickly learned how to "tune in" to your wants and desires and not waste your time. Once again, customer service is so important. If you're happy, I know you'll refer other people to myself and keep me doing something that I truely have a passion for. and outstanding service at a reasonable price! • Client Satisfaction – If at any time you are not satisfied with my service, you can cancel your listing. • Full time agent since 2002 • Goal – Customers for life!